Chicken breast fillets, water, soy protein isolate, salt, spices, flavour, in a coating of wheat flour, water, yellow corn flour, toasted wheat crumbs, cornstarch, salt, spices, guar gum. Browned in vegetable oil (canola and/or soybean). 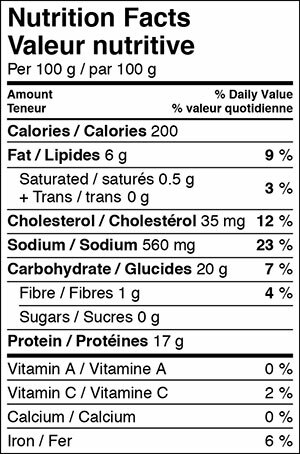 Glucose/fructose, water, distilled vinegar, modified corn starch, tomato paste, apricot puree, plum juice concentrate, salt, garlic powder, natural flavour, citric acid, malic acid, spices, onion powder, xanthan gum, sodium benzoate, potassium sorbate, sulphites.Honey Mustard Sauce: Mustard, sugar, glucose/fructose, honey, vinegar, tomato paste, brown sugar, natural flavour, chili peppers, salt, modified corn starch, garlic powder, onion powder, spices, molasses, soy sauce (fermented soybeans, maltodextrin, salt), tamarind, xanthan gum, caramel colour, red 40, sodium benzoate, potassium sorbate, sulphites. Preheat oven to 450F (232°C). Place frozen chicken tenders on the baking sheet, place on middle rack in oven and heat for 30 minutes, turning once, until heated through. Preheat oil to 400F (204°C). Cook for 4½ - 5 minutes.